We hope that you had a great summer! 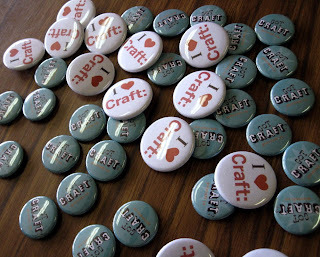 This is a quick reminder that the next Got Craft event is scheduled for Sunday, December 7th, 2008 from 11:00am to 6:00pm at the Royal Canadian Legion at 2205 Commercial Drive. Early bird deadline is on Friday, October 3rd, 2008 and applications may be found by clicking here. Trend event showcasing Canadian Designed, Canadian Made, clothing, accessories and home decor labels. Line up early each day to be one of the first 25 people through the door and you will enjoy a fabulous goodie bag worth over $50. Tickets are $5 and can be purchased at the door with $1 from each ticket sold supporting St. Elizabeth Home Emergency Shelter for Women and Children. For more information please check out their website here. Go check out some past and present Got Craft vendors including Pascale. Mark, Track and Field Designs, Toodlebunny and Fiveleft Leather.